Hello readers, during this week; if you didn't know already CHA (Craft and Hobby Association) winter 2009 trade show is going on, where all the major craft and scrapbook companies release their new products. 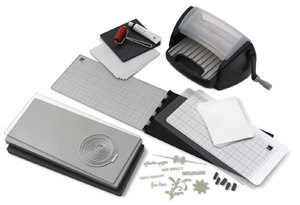 And apart from all the new lovely scrapbook papers that I will be spending my pennies on, I am REALLY excited about a new 'letterpress combination kit' by Quickutz, as part of the Lifestyle Craft brand. 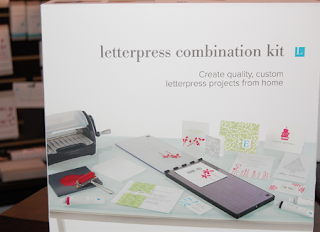 I've never seen anything like this, and I can't wait to get my hands on one and have a go because I'm a huge letterpress fan! I want one too , it looks really fun !! This looks amazing!!!!! I can't wait to learn more about it!